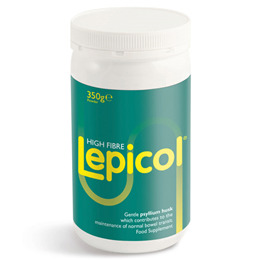 Lepicol is a completely natural high fibre food for help maintaining and sustaining healthy bowels. Lepicol has been formulated to help support the cleansing and regulation of the bowels in a gentle, natural way and is suitable for regular, everyday use. Lepicol - Healthy Bowels Formula helps to maintain normal blood-sugar levels. The first is psyllium husks which provide the gentle fibre that is important for those with sensitive bowels. It helps support the body in pushing waste matter through smoothly and quickly. Lepicol also contains Inulin (prebiotics) which have been shown to complement high fibre foods for healthy bowels by supporting intestinal healthy bacteria (probiotics). The third ingredient is Probiotic bacteria. It is now clearly recognised that long term health of the bowels can depend on keeping the levels of good bacteria in the bowels at a higher level than bad bacteria. Lepicol is the ultimate high fibre food in the support and maintenance of healthy bowels and it is the top selling product for ‘healthy bowels` in the UK. It helps support the body to eliminate food and other body wastes. Clearly most people are now aware of the need to take in more fibre, particularly if you have sluggish bowels – and for this many rely on fibre in their cereals. However, consuming extra coarse or bran fibre is not the whole story. Bran fibre from wheat can be too abrasive for many, particularly those who have allergies to wheat. High fibre food, for the support and maintenance of healthy bowels, needs to be from non-wheat sources and the best non-wheat source of fibre is the psyllium husks contained in Lepicol. Microorganism strength: Minimum of 120 million CFU/g (1.2 x 108 CFU/g), equivalent to 600 million CFU/5g dose (6.0 x 108 CFU/5g. Psyllium husks (plantago ovata/ispaaghula), Inulin, Lactobacillus rhamnosus, Bifidobacterium bifidum, Lactobacillus acidophilus, Lactobacillus plantarum, Lactobacillus bulgaricus. Adults: Take 1-2 (5-10g) heaped teaspoons mixed with a glass of water or juice once or twice daily and consume immediately. This should then be followed by a further glass of water. Children / Young Adults: 0.5-1 (2.5-5g) heaped teaspoon mixed with a glass of water or juice once or twice daily and consume immediately. This should then be followed by a further glass of water. Children under 11 years of age should consult a docter before taking this product. It is recommended to take Lepicol 25 - 30 minutes before a meal. *Traces of milk are at a level that would not affect lactose intolerance sufferers. All the Lepicol products have been approved by the Vegetarian Society except for the Lepicol Whole Psyllium Husk - 180 Gelatin Capsules. However with regards to vegan, each of our specific probiotic strains need various nutrition sources to aid their growth in culture. Cow`s milk is used in the fermentation (manufacturing) process, and although it goes through a filtration process a number of times there can still be very small traces of this in the product. There is no additional milk added to the product after this time. This is a standard process used by most fermentation companies throughout the world. Below are reviews of Lepicol Healthy Bowels Formula - 350g Powder by bodykind customers. If you have tried this product we'd love to hear what you think so please leave a review. It certainly seems to work. It would be great to be able to buy cheaper as can’t get on prescription even though recommended by the doctors. Crazy world. Found Bodykind a few months ago. I am really pleased with their service. I have relied on Lepicol for many years. I now have the perfect combination of reliable product and reliable provider. Excellent - definitely to be recommended. This product works extremely well. I use it when necessary. Great service, excellent product, well done body kind. Excellent product and price. Does what it claims to on the label. Does what it says , fast delivery exellant services , will shop again . Bought this product on recommendation. Works wonders to maintain a healthy digestive system especially after over indulgence. Helps you to feel fuller so snacking between meals no longer a problem. bodykind's service is 100% from placing the order to the super quick delivery. Lepicol is a completely natural high fibre food for the support and maintenance of healthy bowels and has been formulated to do it in a gentle, natural way.